Serena Hernke builds a track for her Ozobot, a small round robot that responds to color on a track, during a science activity led by Jerrod Buckner at the Shorewood Elementary School Family Science Night May 24, 2018. Yang, a Shorewood Elementary School parent in Madison, just wrapped up a fun night with her seven-year-old daughter, Serena Hernke, who presented a science project at Shorewood’s Family Science Night in late May. Family Science Nights are coordinated by Audrey Gasch a professor of genetics in the School of Medicine & Public Health, who helped jumpstart the initiative about five years ago. The goal is to bring science outreach activities into schools and communities to reach families who may not otherwise experience science at the UW-Madison campus. Gasch says the program has helped connect dozens of schools and community centers each year with hundreds of scientists and outreach groups like the Discovery Outreach team at the Morgridge Institute for Research. The Discovery Outreach team participated in 14 different Family Science Nights across Madison and Verona schools and community centers including Waunakee Library, the Goodman Community Center and the Madison Children’s Museum this past year. Family Science Nights are a fantastic way to reach more communities and new audiences to inspire scientific curiosity among learners of all ages, she adds. Building relationships with families is a particularly lasting, memorable part of Family Science Nights, says Jerrod Buckner, assistant outreach director at the Morgridge Institute. “I’ve been able to communicate science to little kids, but also with parents, first-generation parents and their students, teachers, scientists who are parents and many more. For me, that’s been really exciting,” says Buckner. When Buckner attends a Family Science Night, he likes to bring out an ever-popular science activity: ozobots. These round, finger-sized robots follow tracks and respond to color. 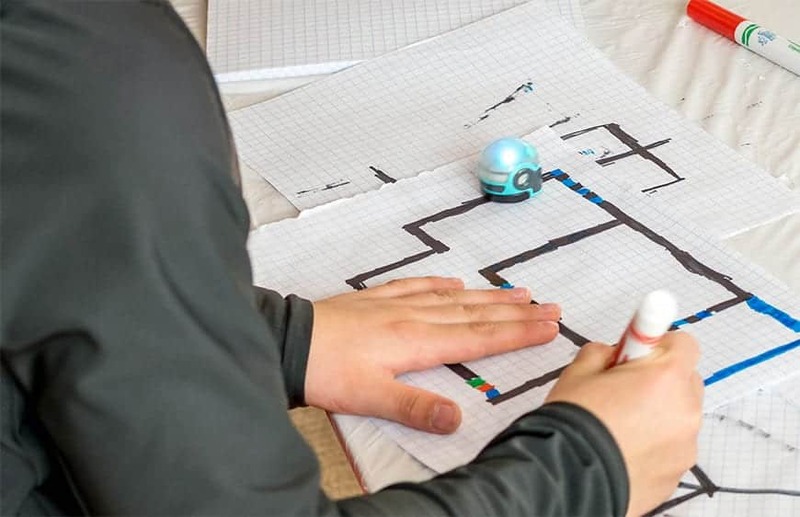 A coding sheet shows participants how they can create a custom track and build options like speed, special moves and directions for the robots. Each Family Science Night is a little different. Some schools and community centers include short-activity based stations (as many as eight) for families to explore at their own pace while others host fewer, more in-depth activities. Many events incorporate students who present their own science projects like Yang’s daughter Serena who presented a Bouncing Bubbles Project.